Through their first three albums, the Michele Fay Band have marked a steady progression. The group's 2008 debut, Live and Local, was a sturdy effort that overcame excusable freshman foibles with agreeable, folksy charm. On their first proper studio record, Travelin' That Road (2010), MFB sanded away those rough edges. And on Endless Sky (2012), the band continued to fine-tune its approach, honing in on and highlighting some key strengths — namely, Fay's amiable delivery and rootsy songwriting chops. On the newly released Believe, the Michele Fay Band get even more granular, serving up a suite of material that plays exclusively to their front woman's best assets. With a mix of understated originals and well-placed traditional covers, played and sung with relaxed polish, personality and taste, the record is easily the band's strongest to date and suggests newfound confidence from Fay. No one would ever mistake Fay for a diva. With her plain, even-keeled singing style, she's not an overly dynamic vocalist. But when given room to amble, she is a very effective one. Breezy, mid-tempo folk tunes and gentle bluegrass ballads are squarely in Fay's wheelhouse. And that's precisely the band's focus on this latest record. The Fay-penned opening title cut sets that easygoing tone. "Believe" is a Carter Family-style mid-tempo bluegrass number centered on a sweetly familiar, undulating vocal melody. It's given light Appalachian accents in the form of Fay's gently rippling banjo and tastefully restrained acoustic guitar licks from multi-instrumentalist Tim Price. Next up is "Going to the West," one of the album's three trad covers. It's an obscure tune and, owing to some funky timing, deceptively challenging. Fay's straightforward version is highlighted by Kalev Freeman's lilting fiddle and some pretty vocal harmonies with bassist Mike Santosusso. On previous records, Fay stumbled when tackling more upbeat numbers. She was guilty of over-singing and appeared too stiff and staid to truly loosen up. This is less an issue on Believe. In part, that's because most of the material is low- key, playing to Fay's natural strengths. But even on livelier numbers, such as "Falling," the island-tinged "Good Day" and "Moose in Love," she sounds self-assured. By the way, that last song is a cheeky ditty about a moose falling love with a dairy cow ... because these things happen in Vermont. Still, Fay is at her best when crooning and cooing, which is why ballads such as "Morning Bird" and "Don't You Remember Me" are album standouts. The latter is another duet with Santosusso, whose easy, tuneful tenor is the perfect complement to Fay. Believe closes on a version of the classic train song "Wabash Cannonball." If this were an earlier MFB album, the rousing tune might have been, well, a train wreck. Instead, it's a fine, fun performance that finds Fay loose and singing with a welcome hint of swagger. Really, it's emblematic of just how far Michele Fay has come. The Michele Fay Band play at Lyman Point Park in White River Junction on Wednesday, July 8, as part of the Hartford Summer Concert Series. 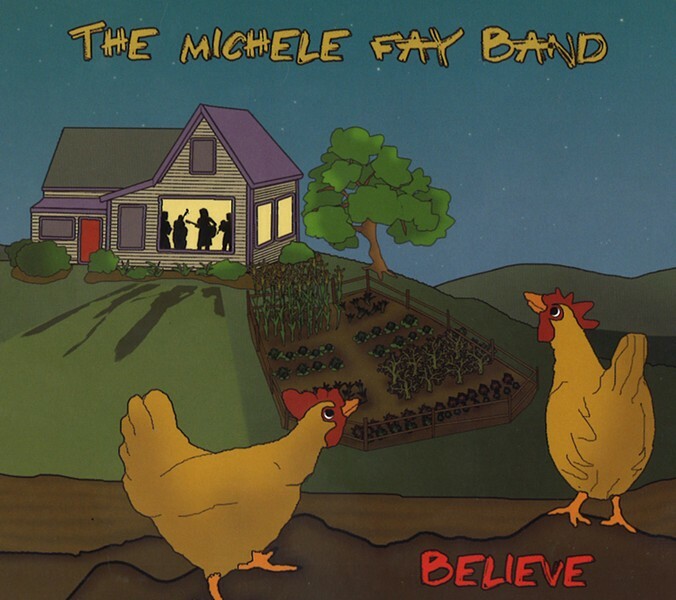 Believe by the Michele Fay Band is available at CD Baby.